Start By Identifying the Weed First, If Possible! 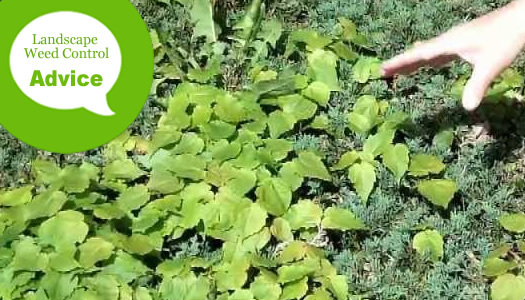 Before you can decide which method of weed control is best, it's sometimes a good idea to identify the weed. WeedAlert.com has a massive database of weeds broken down into regions, then allowing you to first identify a weed from a thumbnail photograph. Problem is, there are thousands of types and varieties of weeds! But if you have some extra time on your hands and want to identify the weeds growing in your landscape visit their site. How you eliminate or control a specific type of weed depends on whether it's an annual, biennial, or perennial. Annual weeds complete their growth in a single season and have shallow roots. Annual weeds should be destroyed before they flower and make seeds. Perennial weeds are harder to remove since they may have large taproots, rhizomes, or runners that are hard to get rid of completely. The tiniest piece of root remaining after pulling a perennial weed, such as Nutsedge, can produce a new plant. If you have lots of existing weeds growing in your landscaped areas and don't want to pull them all, the alternative is to spray them with a weed killer. These are post-emergent products such as Killzall and the more expensive Roundup. They are non-selective herbicides with a multiple-use formulation. They work quickly (within 7 to 14 days) to kill broadleaf or grassy weeds and many types of brush and vines all the way to the roots. Unless you want to kill your existing lawn, or "weed patch" of a lawn, DO NOT spray a Gylphosate-based weed killer on your lawn! When used full strength, super-strength Glyphosate products (41%) can be applied to stumps to prevent regrowth, but the stump must be sprayed immediately after cutting. Glyphosate can also be useful to clean weeds from areas near fences, paths, patios, driveways, and buildings. TIP: Glyphosate should be applied to actively growing weeds, preferably before the seed heads form. Application should be made using a pump sprayer, hand sprayer, or hose-end sprayer. For best results, apply on a warm, sunny, calm day when the temperature is above 60 degrees F and rainfall is not expected within 24 hours. Though you can spray Glyphosate around ornamental shrubs and trees, keep in mind that if the spray contacts the foliage of these plants that injury or death of the plant might occur. Therefore, pick a calm day when the wind isn't blowing to spray. While Glyphosate will control any plant you treat, it will not transfer through soil to neighboring plants. In order to avoid dumping too much chemical in the environment, I always recommend spot spraying weeds when using any herbicide spray. Spot spraying also uses less product, which saves you money! Before spraying any chemical, always make sure to read and follow all instructions on the label for mixing and application. In addition to Glyphosphates, there are other types post-emergent weed killers that work well to kill existing weeds in landscape beds. These selective herbicides are designed to only kill certain types of weeds or grass plants while leaving others alone. For example, there are over-the-top weed killers that can be sprayed over the top of desirable ornamental shrubs and groundcover plants to kill Bermudagrass that has crept its way into a landscape bed. But hey, whose fault is that? Maybe the one who forgot to edge the lawn for 6 weeks? In any event, if you have Bermudagrass, or any other weedy grass growing in a groundcover planting, look for an over-the-top weed killer to get the job done. Weed preventers can be applied in ornamental landscape beds, islands and natural areas to kill weed seeds before they sprout. Avoid using weed preventer / fertilizer combination products. Apply these products separately for best results. Perhaps one of the most effective measures that you can take to prevent weeds is landscape fabric. Most home stores or local nursery and garden centers carry it. It comes in various size rolls - usually 3 feet in width and from 50 to 150 feet in length. Rolls usually run around $10 to $25 depending on the length. If the area you intend to cover is very large, larger rolls can usually be special-ordered, and come at a substantially lower cost. When installing landsdca0pe fabric in a landscape bed in which there are plants already growing, simply cut an "X" in the fabric to easily slip it over small plants. Cut a slit from the side to the center of the fabric to slip it around the trunk of a large tree or shrub. TIP: Make sure the landscape fabric you buy is porous and not plastic. Plastic will suffocate any plants in the bed. Porous fabric will allow nutrients and fertilizers to pass through, as well as allow water to pass through and evaporate. Application of various types of mulch can greatly reduce weed population in landscape beds and islands. A two-inch layer of shredded wood mulch is an excellent way to suppress weed growth. be careful though not to apply too mulch mulch. Any more than a 2-inch thickness can be problematic preventing water from reaching the roots of plants. Eventually, wood mulches break down into rich organic matter that will beneficial to the plants and trees growing in the landscape bed. Weed seeds can lie dormant deep in the soil for many years. So, disturb the soil as little as possible. Cultivating the soil by raking, tilling, or turning it over can uncover dormant seeds and often within days you'll have weeds appearing. Once on the surface, they receive the water and sunlight they need to make them grow. When you dig to plant, make sure to mulch good after planting, leaving no dirt exposed. Also consider the application of a weed preventer any time you disturb the soil in a planting area. Destroy weeds before they flower and go to seed. When weed flowers are allowed to go to seed your problem becomes much worse, especially if these weeds are added to your compost. Compost must be hot (140-160 degrees F) to kill the weed seeds, and most home compost operations don't reach these temperatures. So make sure to cut weeds back before they can produce seed and don't add weeds with seeds to your compost pile! Rather than water entire landscape areas with overhead irrigation, consider using soaker hoses, drip irrigation, watering cans, and container watering systems that only water the plants you want to grow. Apply fertilizer only around the plants you want to fertilize. No need to waste water and fertilizer on weeds you don't want! Hand pull large, established weeds. Hold the weed by the base of it's stem, and make sure to pull out the whole root. Remulch if soil becomes exposed. As a weed suppressant, corn gluten acts as a natural weed preventer by inhibiting seed germination by drying out a seed as soon as it cracks open to sprout. problem is this stuff is expensive and it takes several applications before it starts to be effective. Yes, that stuff in your kitchen cabinet. If weeds are caught while young, they can be effectively killed by spraying them with vinegar. Make sure to spray on a sunny day, and when there will be no rain for a couple days. In case you're wondering what's in vinegar that kills weeds, it's the acetic acid. The higher the percentage of acetic acid in the vinegar, the better it will operate as a natural weed killer, technically speaking. Vinegar used for culinary purposes is relatively low in acetic acid (5%), so repeated applications will be necessary when using it as a natural weed killer. There are stronger vinegars available that will be more effective.